Felicia Burkhalter and Millie Davis remember how much their father Dallas Harris loved to walk his property along the Boise River. It was a way to relax and share with his kids his love of wildlife, as he’d point out a quail family, a noisy pheasant or other wildlife. Harris, who brought his wife, Alta, flowers every day, might also stop to pick wildflowers for her or to admire a bald eagle, a red-tailed hawk or birds migrating along the river. Dallas’ walks are a prized memory of the daughters’ ranch life in the Barber Valley, where Dallas acquired nearly 2,000 acres stretching from what is now Bown Crossing and Surprise Valley into the foothills. The Harris land included sawmills, a company town, a railroad line, a brick factory and the Barber dam. And it was home to black bears, pronghorn antelope, cougars and coyotes. Warm Springs Gulch was once wintering grounds for the Shoshone-Bannock tribe. 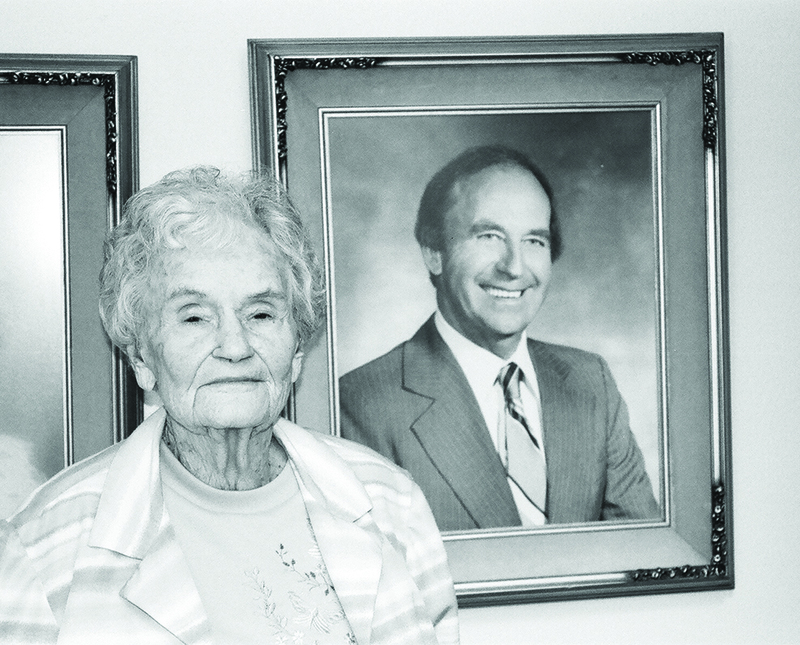 Decades later, as the two women and their brother Randy Harris began to develop the Harris Ranch planned community, their father’s love of wildlife and his life as a cattle rancher, lumberman, and horse breeder were important guiding principles of their father’s legacy. “We wanted to honor him,” said Davis. Alta Harris with a photograph of her husband, Dallas. Entrusted with about 1,800 acres and the guidance of a master plan Dallas Harris completed in 1976, Davis, Burkhalter and Harris traveled the U.S. to study other planned communities to create something their parents would be proud of. “I feel our dad and mom gave us such a huge gift,” Burkhalter said. They embraced principles of smart growth and new urbanism to create Harris Ranch, now a bustling and diverse community of 1,100 homes, including single- and multi-family residences, retail and commercial space. The pedestrian-friendly development promotes walking and biking with paths and foothills trails. Community interaction is encouraged through the use of alleyways, shared open space, pools and postal pavilions. There are river walks and parks named for their parents. And a wildlife mitigation plan is supported through resident fees. Their vision for a sustainable community also included a fire station, which they donated land for. There is a bus line, two schools and plans for a third. They wanted to create a neighborhood where residents can shop, eat, work, and play without having to get in their cars. And future plans include a grocery store, an elementary school connected to a 7.5-acre village green and a “Bown Crossing on steroids,” which will have shops and restaurants and be about triple the size of Bown Crossing. But Harris Ranch hasn’t been without controversy. There have been conflicts over increased traffic on Warm Springs Avenue and resulting traffic calming measures that changed the direct route of Highway 21. Initial development in the late 1990s was limited to 419 homes until the East Park Center Bridge was built as an alternate route to downtown. Burkhalter said issues with the Army Corp of Engineers delayed bridge construction and slowed building, creating financial strain for the family. She laughed about relying on the Harris family’s experience to get the bridge built, which the Ada County Highway District completed in the fall of 2009. “We were naïve enough to think we could build it since our family had been in logging,” Burkhalter said. “We told Doug we were always going to do the right thing no matter if it hurt us,” said Davis, who built a home next to the family’s ranch house, which Burkhalter still lives in. Fowler organized a charette in 2006. It was series of stakeholder meetings held over four-days and nights that included the family, land planners, architects, engineers, environmental groups, neighborhood representatives, and members of relevant city, county, state, and federal agencies. Groups continued to meet, and they hammered out a plan to guide the entire development. It was approved by the city as the Harris Ranch Specific Plan ordinance and became a part of Blueprint Boise, the city’s comprehensive plan to guide growth. That plan covers 1,100 acres and allows for 2,600 residential units. Fifteen hundred of those units will be multifamily. And the plan includes more than a million square feet of retail and commercial space. Overall, less than half of the 1,100 acres will be developed, Fowler said. The rest will remain open space, including the Dallas Harris Legacy River Walk and Alta Harris Park. Davis said a 105-acre parcel in the foothills is one prime area the family will preserve, although they’re under pressure to allow connection through it to other foothills trails in the Ridge to Rivers system. “The city is putting pressure on us to donate it to a state entity,” she said. But they’re more concerned with migrating deer and elk than the needs of mountain bikers and hikers. “Dad was a real defender of wildlife,” she said. In hindsight, Davis and Burkhalter feel construction delays due to the bridge and recession were a good thing because it allowed them more time to learn. “The most important thing we learned was to trust our instincts,” Davis said. That meant resisting demands to locate the greenbelt next to the river. They knew the area is prone to flooding, as happened this year, so they didn’t want an asphalt path that could leach chemicals into the river. Instead there is a gravel path. “We wanted a peaceful place where kids could walk with their parents along the river,” Davis said. They also decided not to put homes close to the river, although other developers who own adjacent properties have done so. Harris Ranch resident Celeste Miller thinks the family has done an amazing job. “I think Harris Ranch is one of the prides of Boise in terms of real estate,” said Miller. She and her husband Joe moved to Harris Ranch four years ago. They downsized from 3,500 to 2,500 square feet and left behind a huge yard in the East Boise foothills that was difficult to maintain. But it’s not without downsides, she said, referring to an outside developer’s proposal for 125 apartments on the western edge of Harris Ranch. Many residents are opposing it because it will destroy a pond and wetlands and they feel it isn’t designed with the same regard for environmental standards. Miller loves that she can hop on her bike and ride to Lucky Peak, and with all the snow this year, she cross-country skied along the pathway. And she enjoys the diverse mix of neighbors. In 1936, Dallas Harris left Arkansas for Idaho with the experience of working in his family’s lumber business under his belt. He settled in Meridian where many of his family had moved. In 1937, Dallas married Alta Watson in Oklahoma, having met her when he’d worked there for a short time. They moved back to Idaho, driving a flatbed truck with many family members, working their way across the country. Around 1940 Dallas and brother Ivan started a sawmill in Thorn Creek near Idaho City. They built a community—a camp where employees lived, a small school and a church. In 1945, Harris Brothers Lumber Company moved to Idaho City across from the Warm Springs Plunge. The sawmill burned twice, being completely destroyed by fire in 1950. That brought the brothers to Boise, where they bought a sawmill on the western edge of the Barber Valley. The family lived in a home on Warm Springs Mesa. In 1961, Harris Brothers sold the sawmill to Boise Cascade and Dallas agreed not to operate another sawmill for several years. He began to acquire farmland in the Barber Valley for his registered Hereford cattle and Appaloosa horses. Harris eventually bought Producers Lumber near what’s now the Riverside Hotel and moved it to the Barber Valley. Harris bred and showed his prized Appaloosas, riding every day into the foothills. At the height of the ranch there were more than 600 cattle, and a few head remain on the property today. Harris’s daughters recall him as a “cattle whisperer,” and say he was such a lover of wildlife, he’d never let anyone shoot anything on their property. They recalled long days helping to move cattle on horseback, a chore they didn’t enjoy. Alta helped with the cattle as well and was legendary for the enchiladas, beans and pies she made during branding season. Dallas and Alta raised four children, Felicia, Millie, Gary and Randy, and were very involved with the community, church and Democratic Party. Dallas served on boards, the Ada County Zoning Commission and was involved with other community organizations. in 1999, Dallas passed away at age 84. Alta died at age 93 in 2012. This article appears in the Fall 2017 Issue of Territory Magazine.